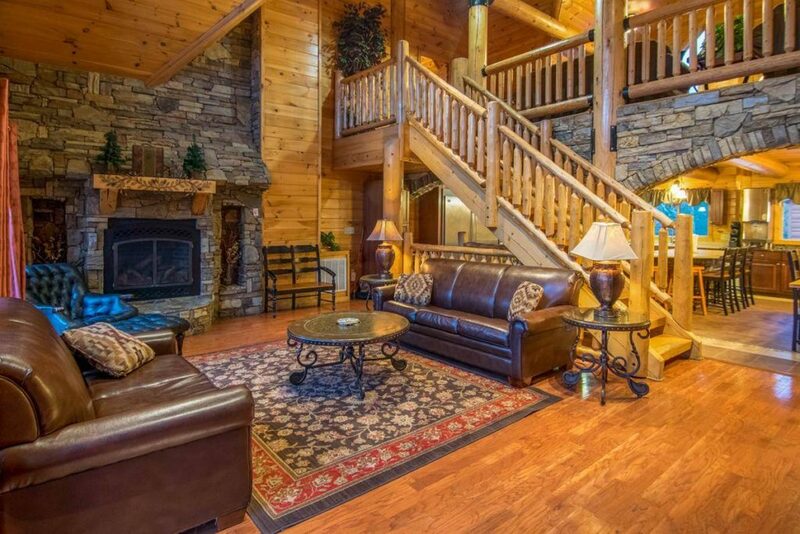 Why even leave our Smoky Mountain Lodge? 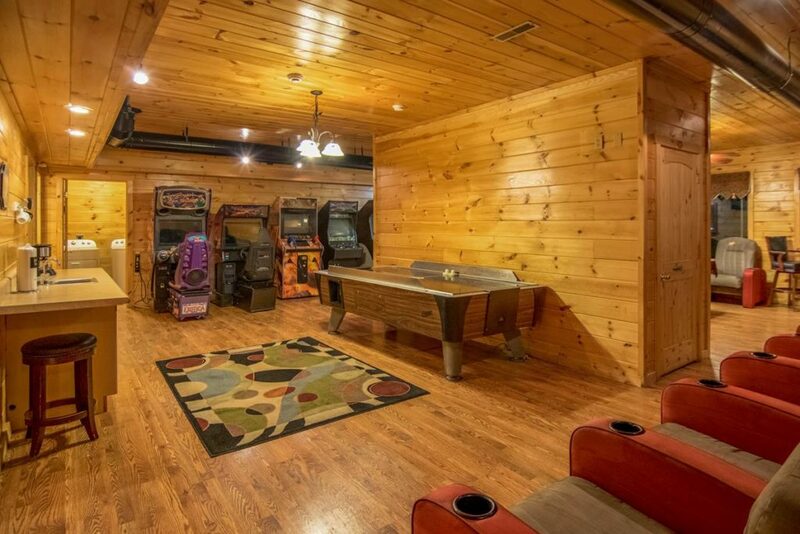 Moose Hollow’s game room features games that will keep you and the kids entertained for hours or even days. 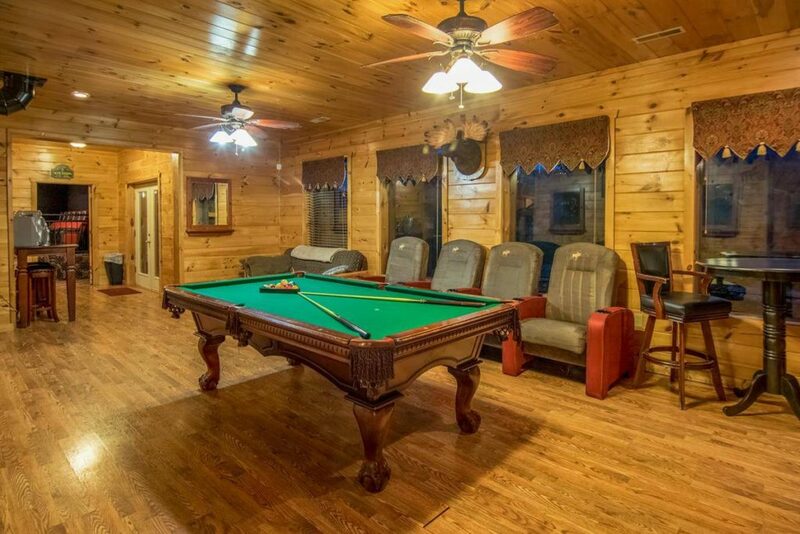 Challenge your friends on to a game of pool on the 8 foot professional style pool table or 9 foot air hockey table. 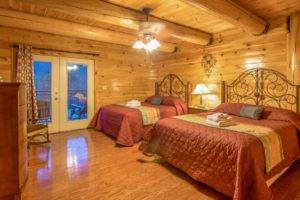 Watch your favorite show one the two televisions featuring Direct TV and hundreds of channels, HBO and Showtime included. 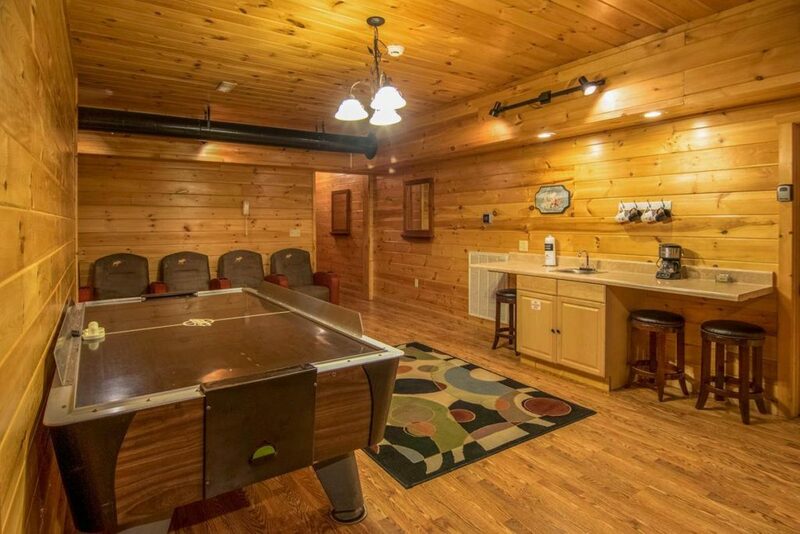 Bring your favorite board games and play on one of the two pub tables. 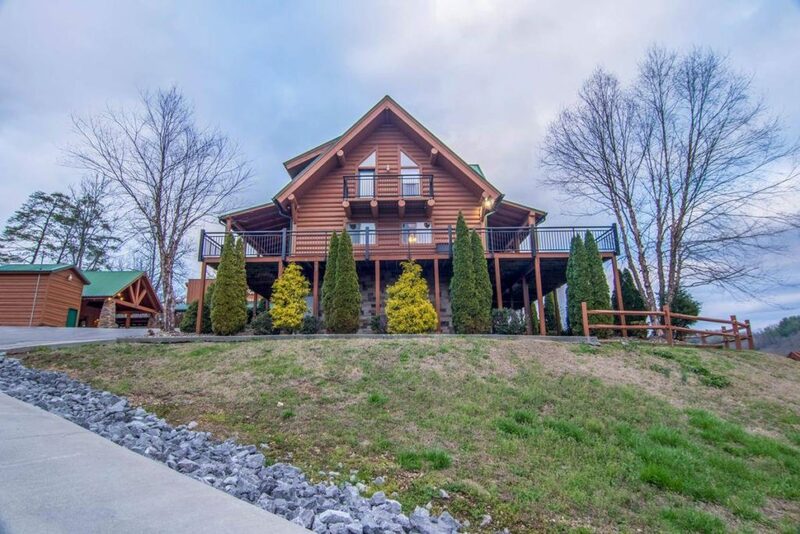 Open the blinds and you will find a wonderful view of the Smokey Mountains, there is also a door leading out to the front of the lodge where you can walk the pathway to a number of the first level bedrooms. 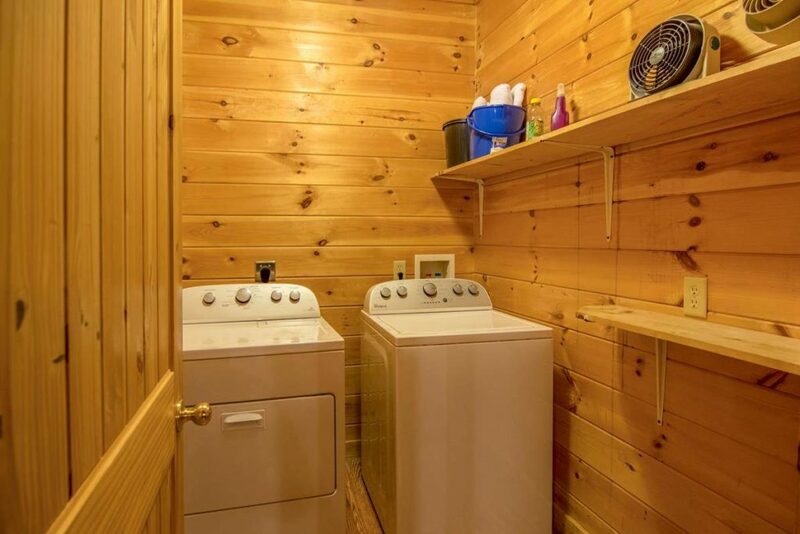 As if this were not enough there is also a tread mill to keep you in shape! 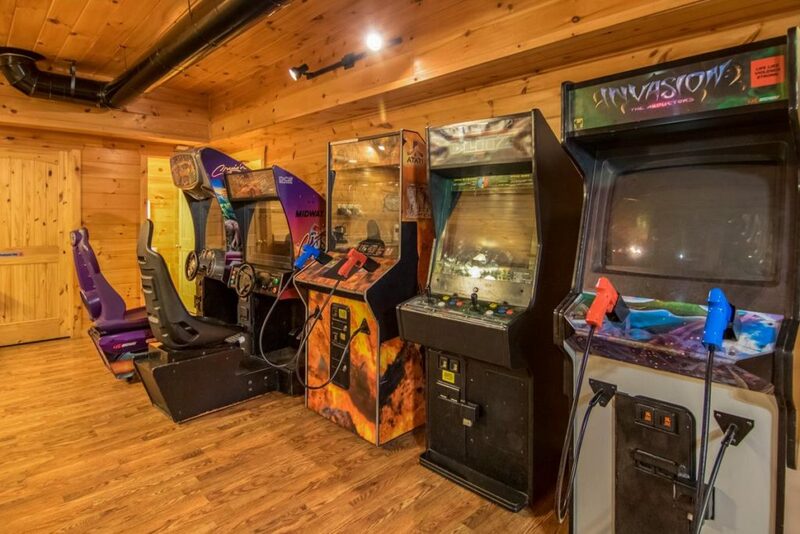 Arcade Games: Ms. Pac Man / Galaga – Maximum Force shooting game – Alien Invasion shooting game – Crusin Exotica sit down racing game – Crusin USA sit down racing game – 9′ Arcade Size Air Hockey Table which will be great for making your own tournaments! 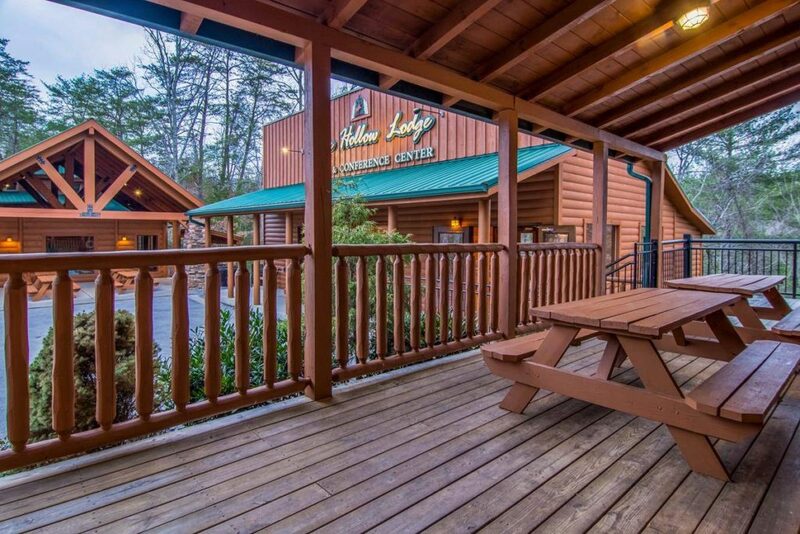 Our Smoky Mountain Lodge is perfect for large group cabin rentals! 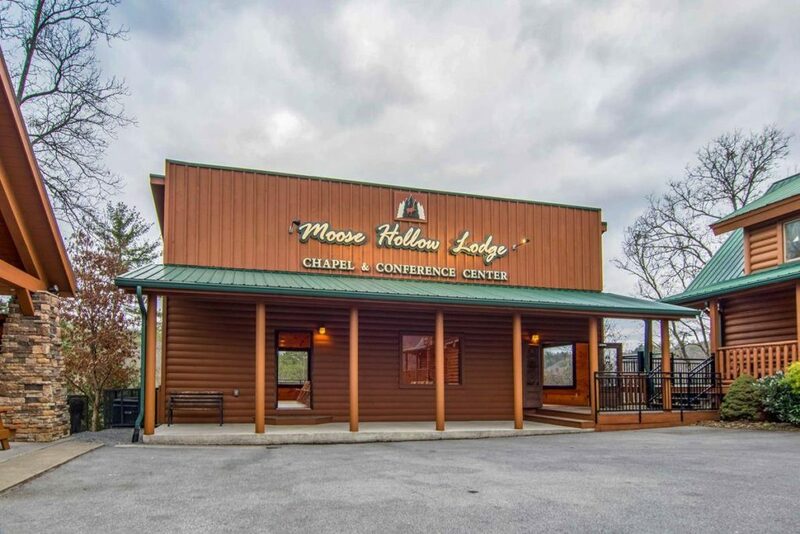 Shake, rumble and vibrate your way to enjoyment in Pigeon Forge’s only 22 seat rumble seat theater! 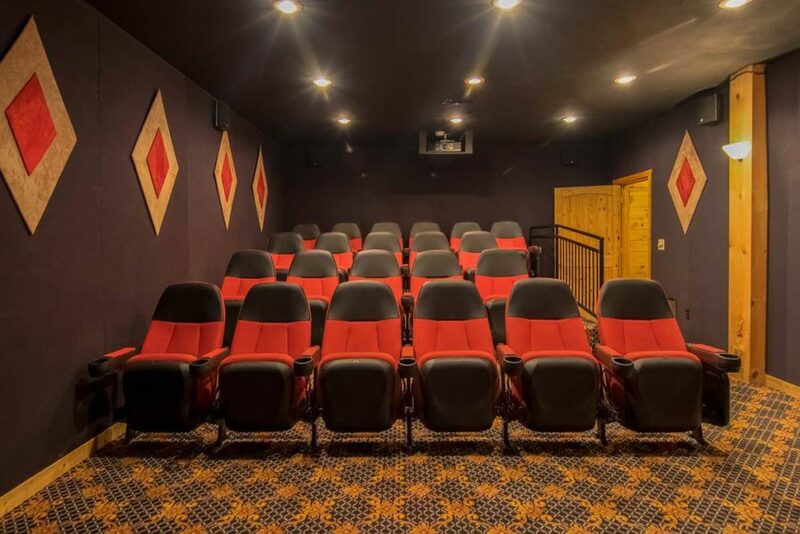 Moose Hollow’s state of the art theater has all the comforts of a real theater without high cost ticket prices. The theater seats were modeled from the Ford F-150 truck and are super comfortable. 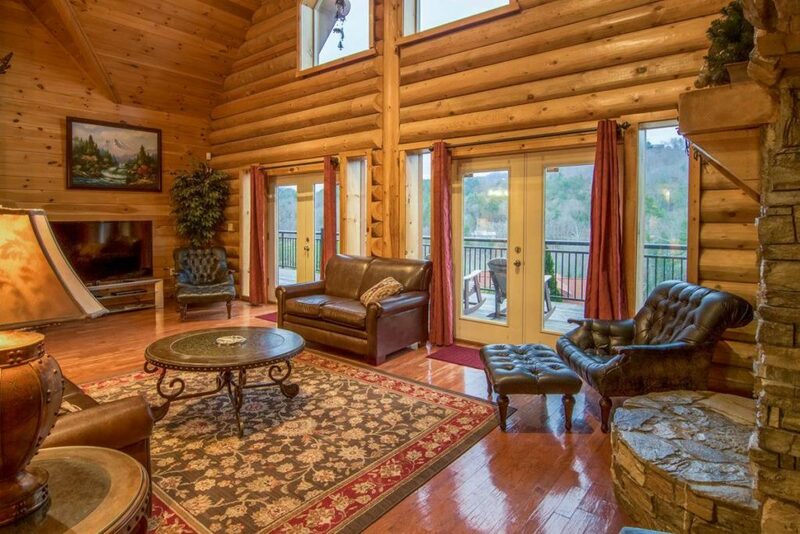 Also, experience the lively 7.2 surround sound while viewing the huge 13’x 6’ screen. 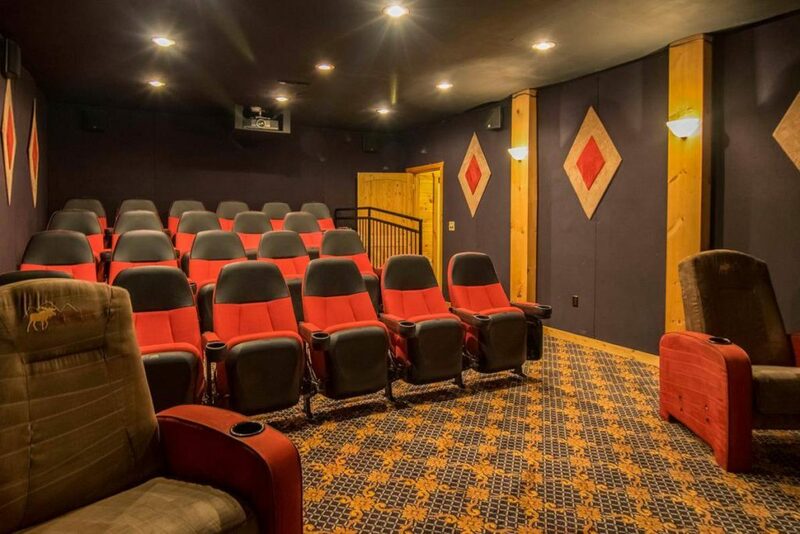 The walls of the is sound proofed to enhance the movie experience, so get ready for all the explosions! 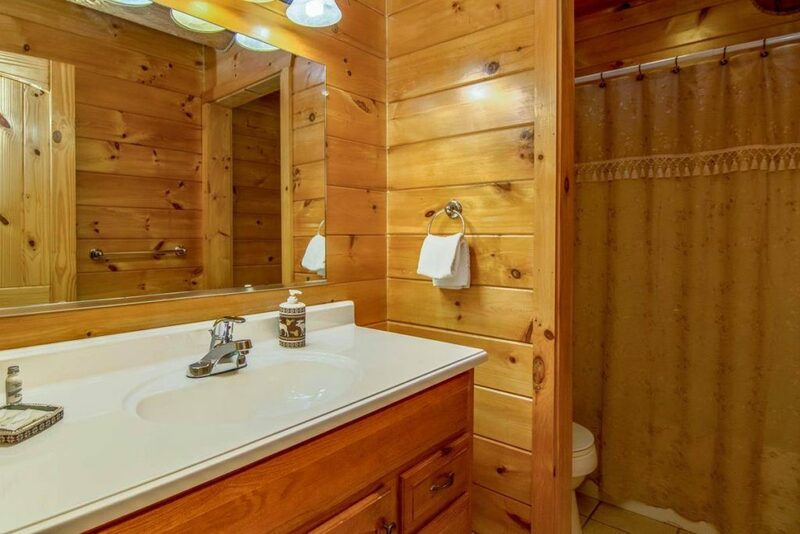 We designed the theater to give you the feeling that you left the cabin for a night on the town. Bring your favorite DVD’s and Blu-Ray Video’s to watch in high definition while spending time with your friends and family. (Sorry, we no longer supply DVD’s and Blu-Rays as they always grow legs and walk away). 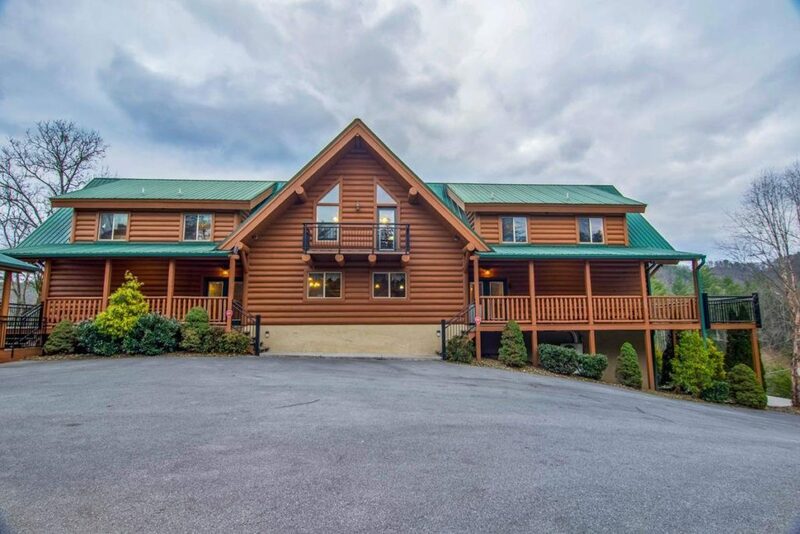 No other cabin theater in Pigeon Forge, Gatlinburg or the Smoky Mountains even compares. 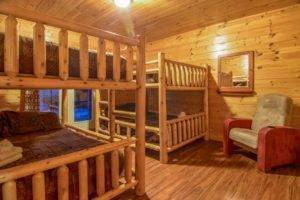 What would large group cabin rentals be without great queen size log bunk beds? Kids and adults will enjoy slumbering together and telling jokes before bedtime. 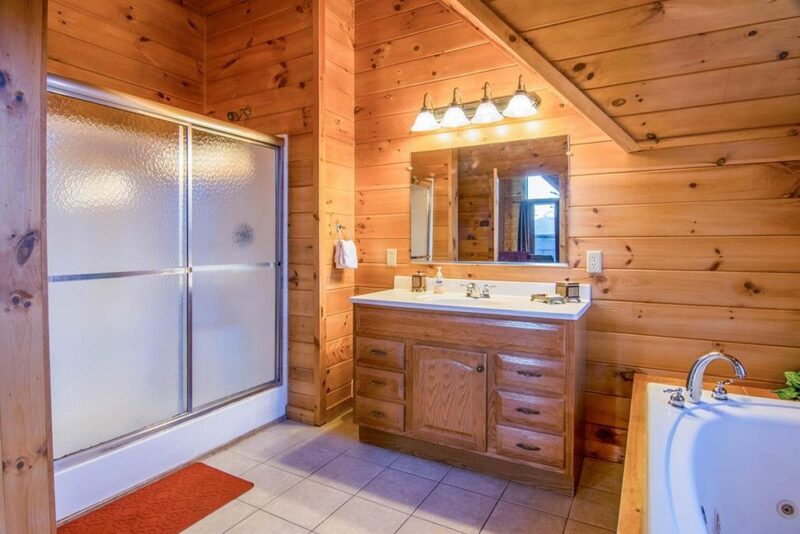 So, there is a capacity of eight (8) in this room and has directly access to its own outdoor patio. 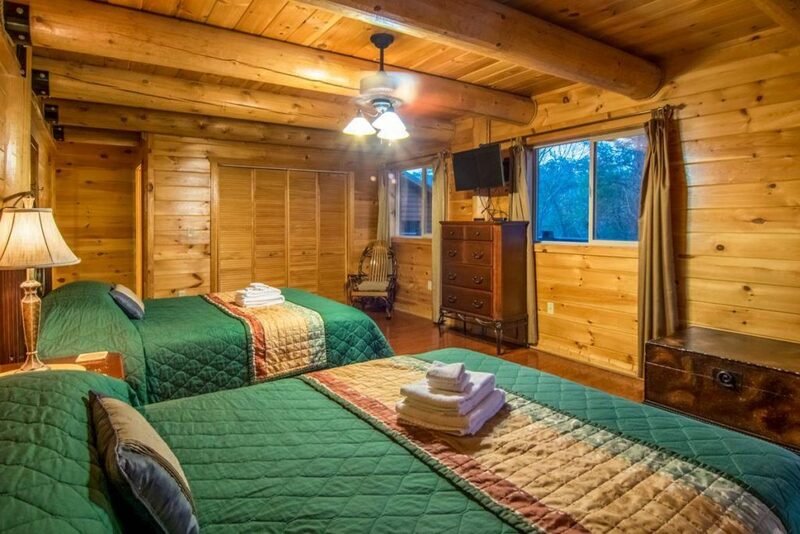 The room is located on the 1st level near the theater and game room and has direct access to the outside. 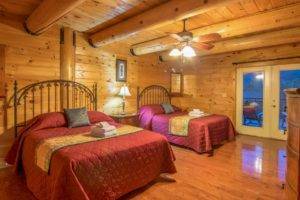 Also, each of our Smoky Mountain Lodge rooms has a television with hundreds of channels including HBO and Showtime. 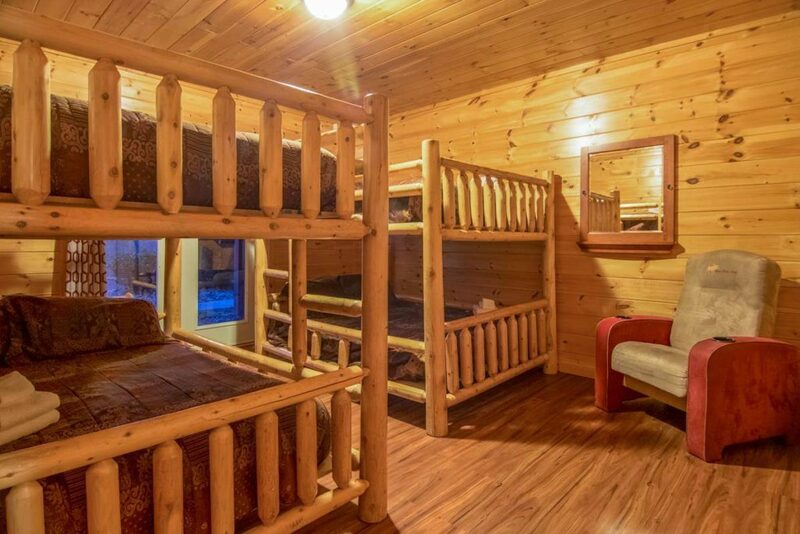 What would large group cabin rentals be without great queen size log bunk beds? 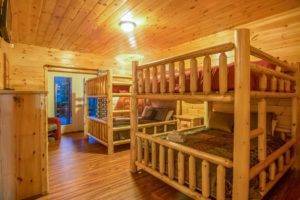 Kids and adults will enjoy slumbering together and telling jokes before bedtime. 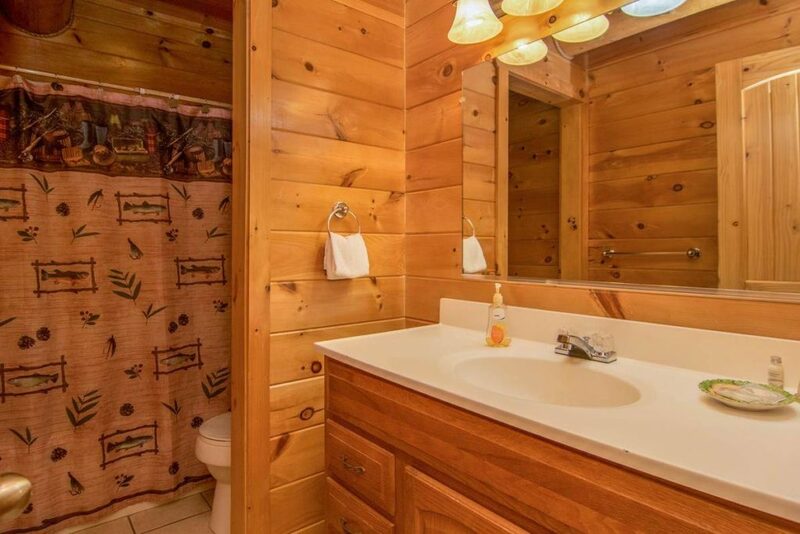 So, there is a capacity of four (4) in this room and has directly access to its own outdoor patio. 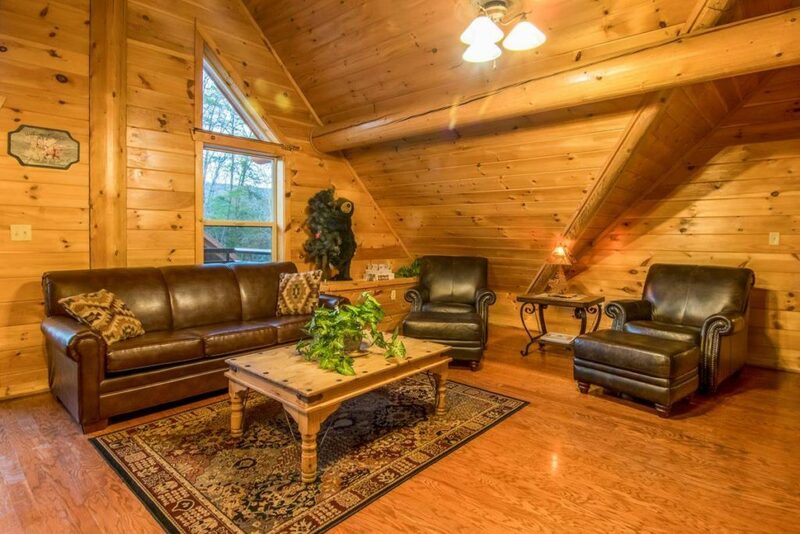 The room is located on the 1st level near the theater and game room and has direct access to the outside. 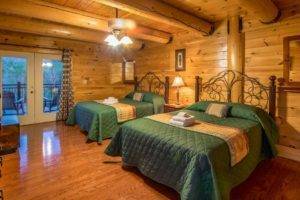 Also, each of our Smoky Mountain Lodge rooms has a television with hundreds of channels including HBO and Showtime. 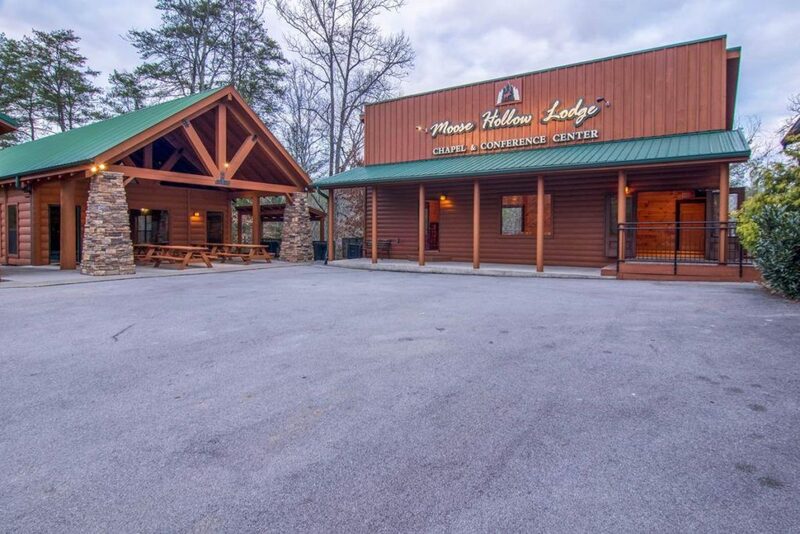 Whether you are entertaining for a wedding, family union or church retreat Moose Hollow features a huge partially covered deck that wraps around all four sides of the lodge giving you access to two large five person hot tubs, 12 rocking chairs, and a view of the Smoky Mountains. 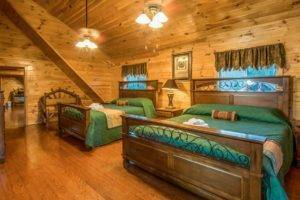 From the deck you will also have access to four of the bedrooms, the living room, and pool house all located on level two of the lodge. 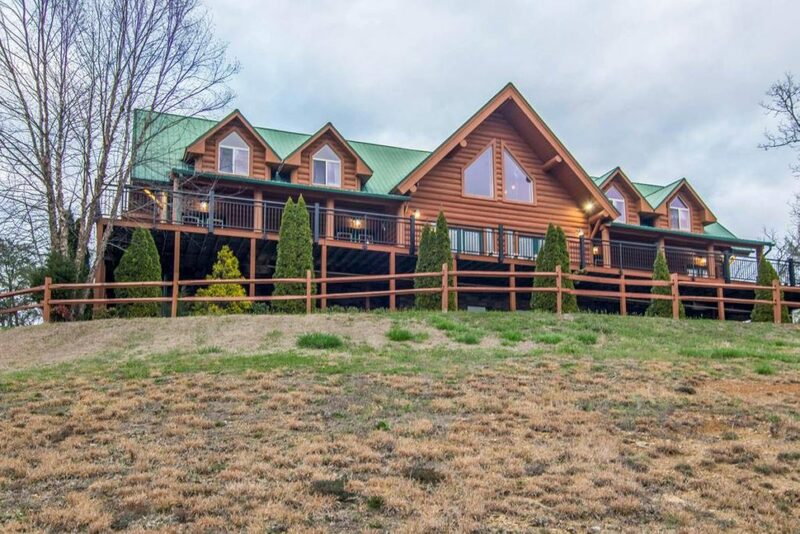 You can even catch glimpse of wild turkey and deer grazing in the pastures from this Smoky Mountain Lodge.. 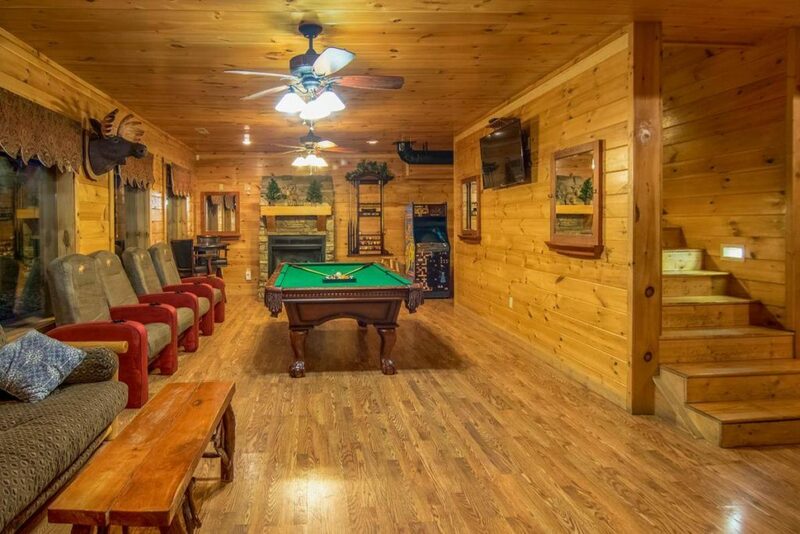 The living room is an elegant place for group gatherings or just cozy up to the gas fireplace while enjoying your favorite show from hundreds of channels including HBO and Showtime on our 60″ Sony Grand Vega television. 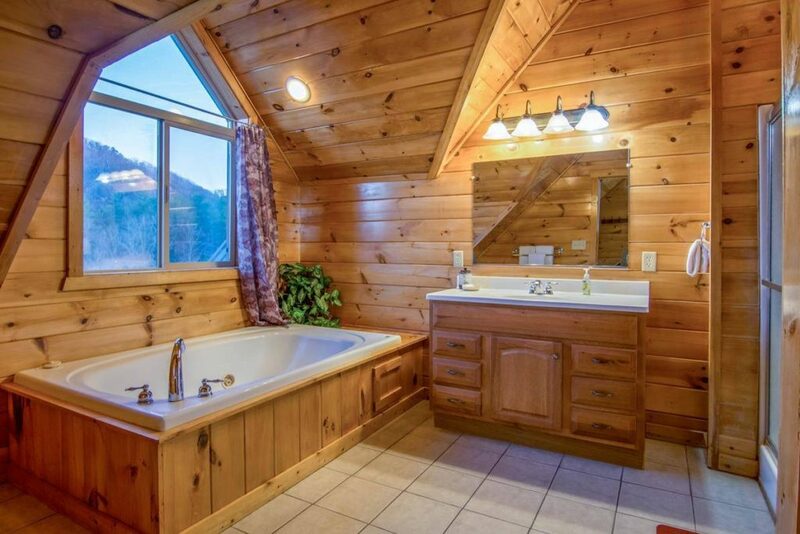 Free wireless INTERNET is available if you like to surf the web. 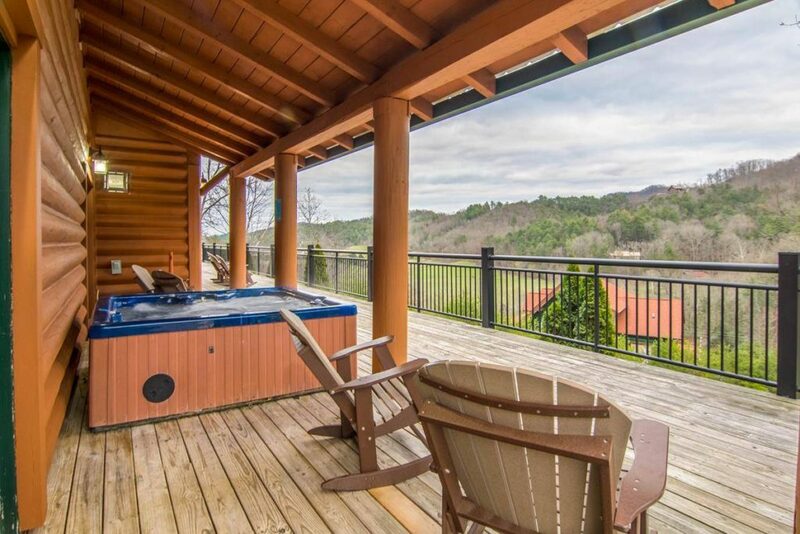 Use direct access to the full wrap around deck with wonderful views. The living room can also sleep two comfortably on a pull out queen sleeper sofa. 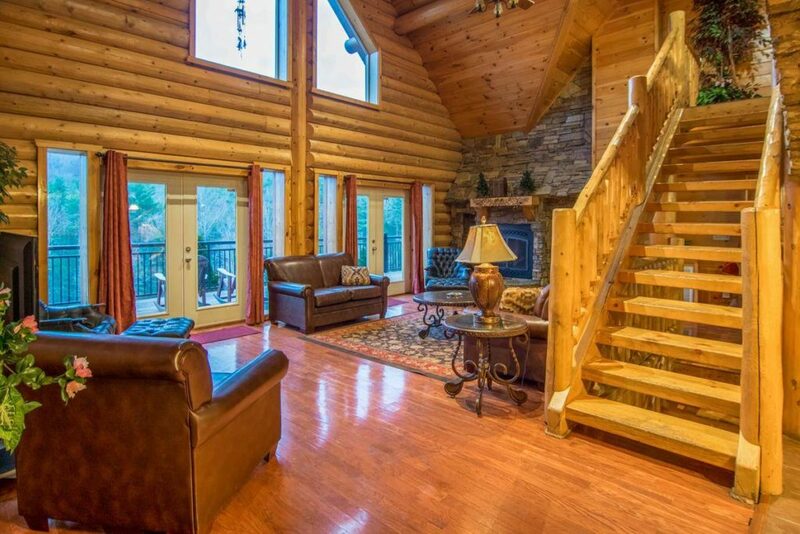 Enjoy the vaunted 30’ ceilings that sport our outdoor cowboy theme as the moose looks down upon you from above. 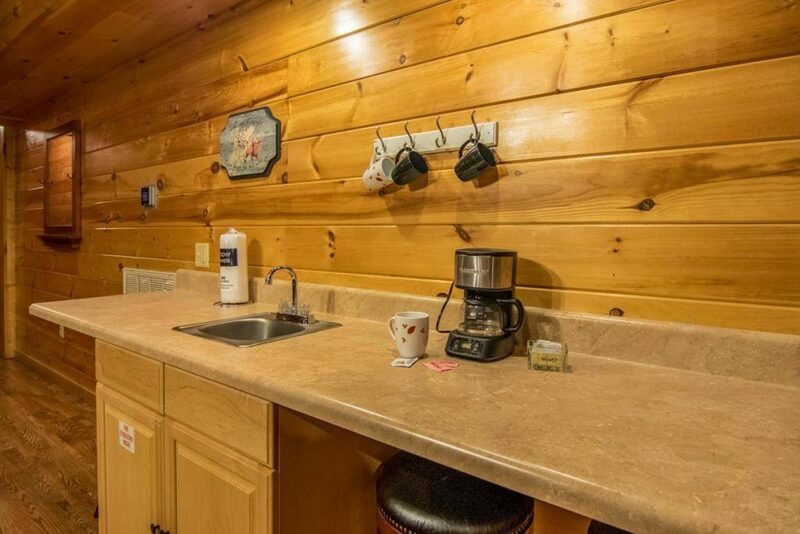 The Moose Hollow Lodge kitchen is fully equipped with beautiful stainless-Steel Appliances, perfect for large group cabin rentals. 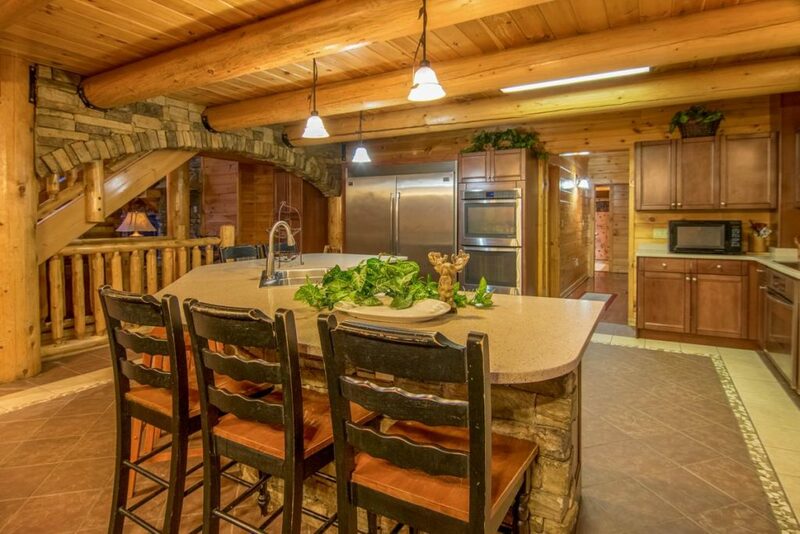 Appliances include a dishwasher, ice maker, ovens, and a full-size refrigerator and full-size freezer. 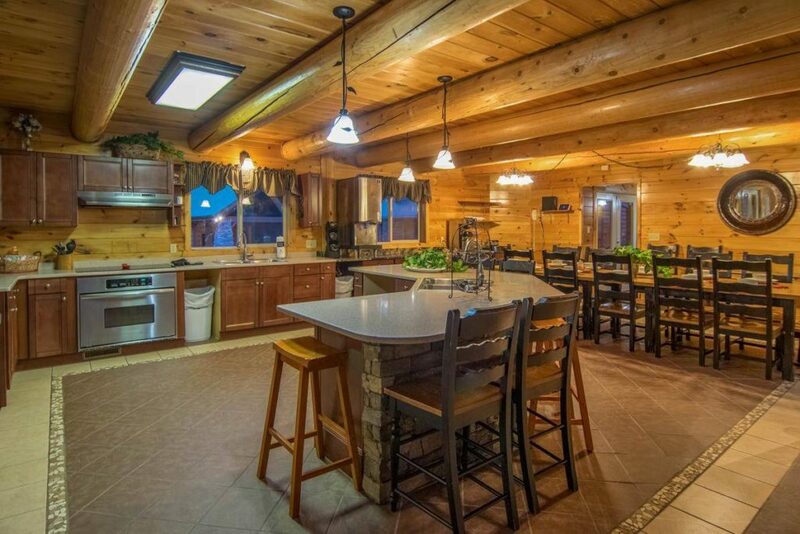 Furthermore, there are two ovens, one is a massive 36” oven and the other is a double wall oven with microwave. 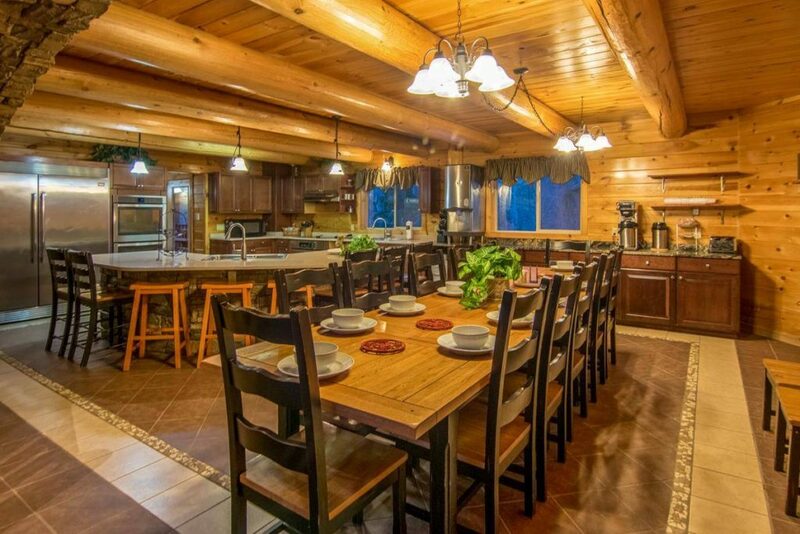 The kitchen is well stocked and has ample quartz and granite counter tops to prepare your massive meals. 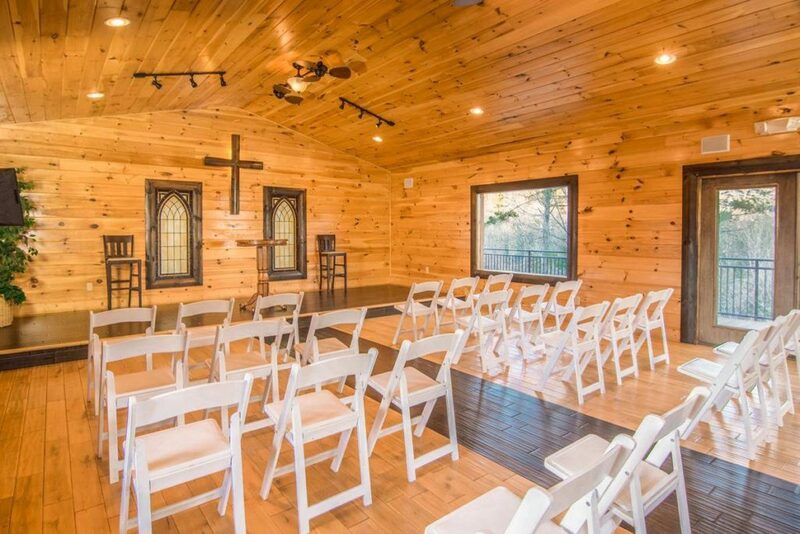 Because you have large groups we provide a commercial Bunn coffee maker and two thermoses to take in to the conference center. Most noteworthy is the commercial ice maker capable of producing up to 320 pounds of ice per day. The ice maker is always a bit hit with large groups. This large group cabin suite has two (2) queen beds, sleeping for four (4). 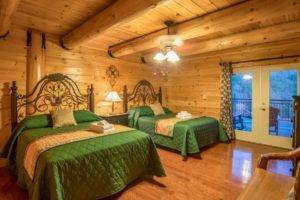 Also available is a ceiling fan, a private bathroom, television with hundreds of channels including HBO and Showtime. 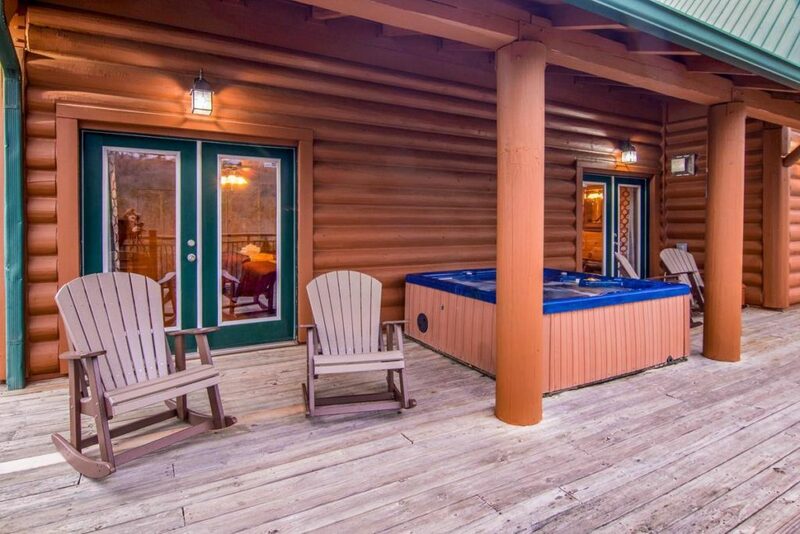 Lastly, this Smoky Mountain lodge suite has direct access to the full wrap around deck and hot tub located outside your door. 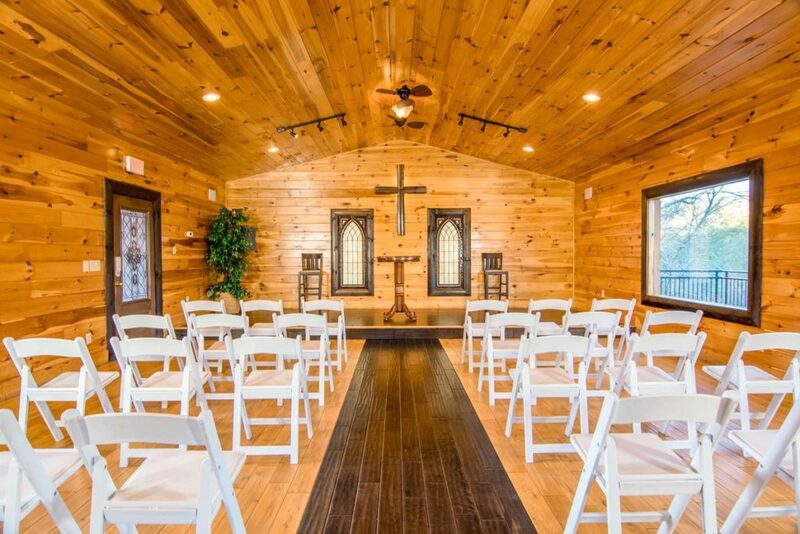 The loft is furnished for seating up to 15 of your guests. 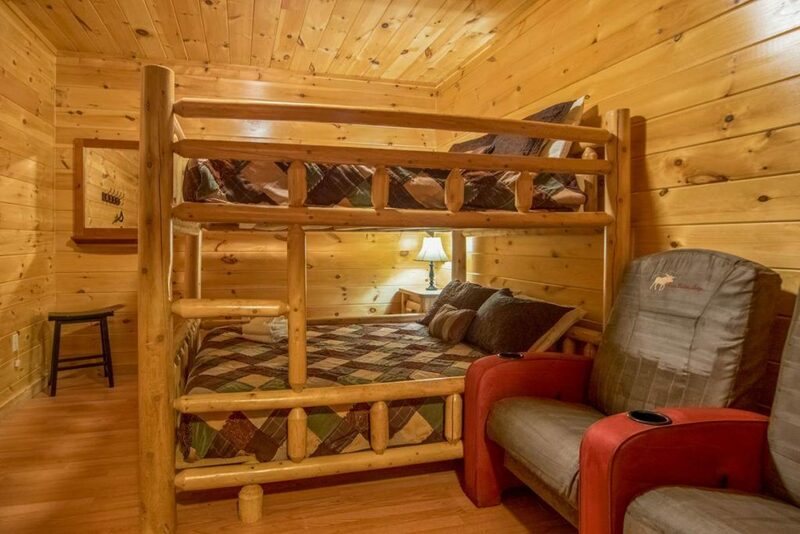 Additionally, it has two queen pull out sleeper sofas for added sleeping capacity for four (4). 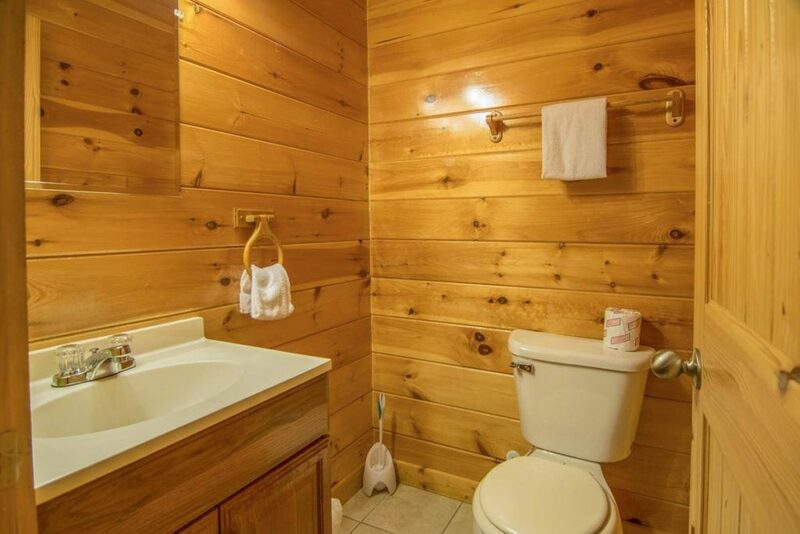 Also, you will find, two easy chairs, four card table chairs, two hickory rocker chairs and a hickory bench. 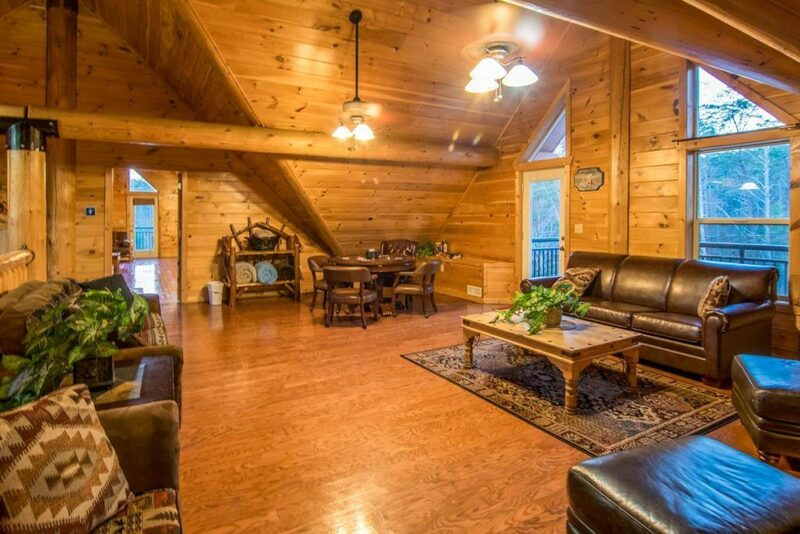 As you sit back and relax in the loft, you have a view of the mountain in the front of this lodge. 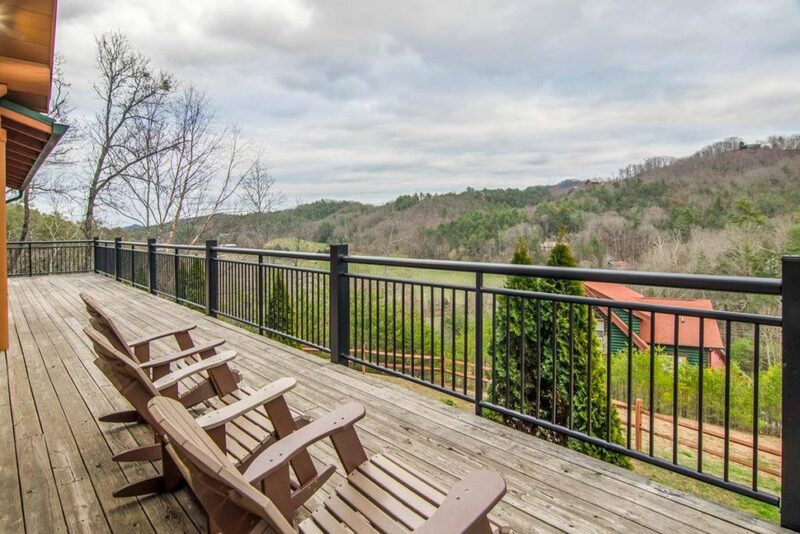 From there you can see the mist rising from the trees in the morning. 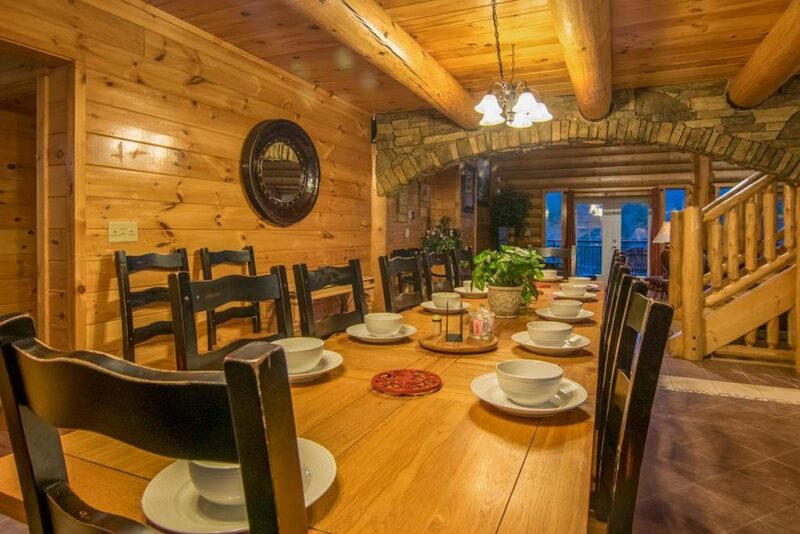 It’s a great place to come together for quite conversation, board games or card playing. 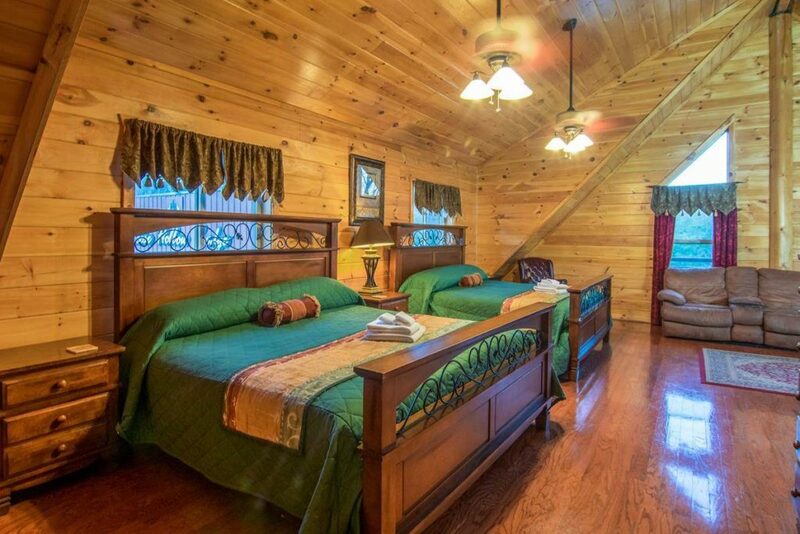 This area provides direct access to the two master suites. 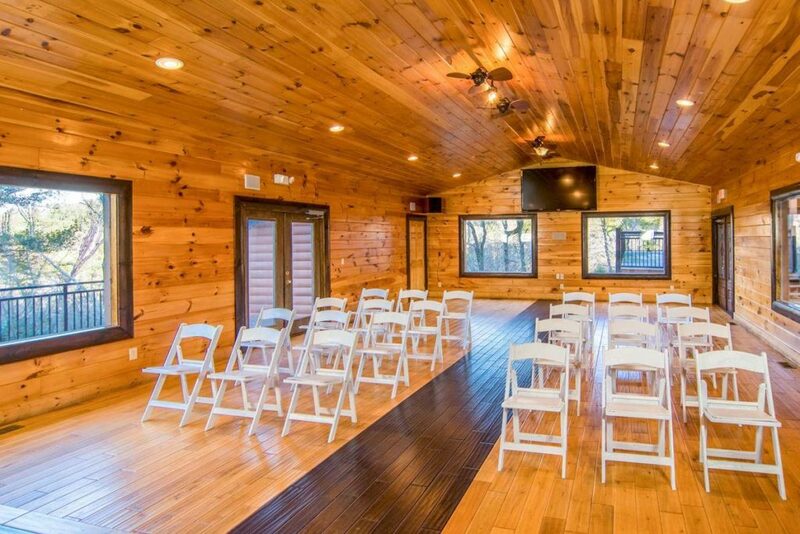 The loft also has its own deck to view the parking area, pool house, chapel/conference room and barbecue area. 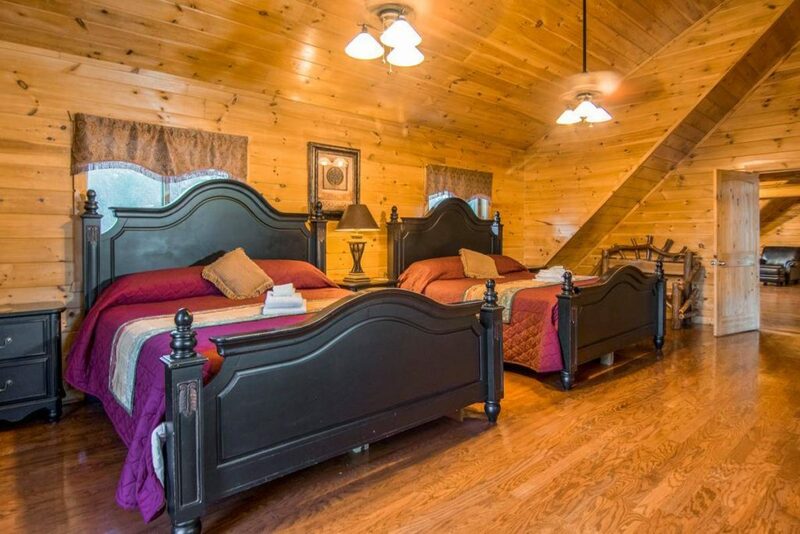 There are two large master suites located on level three each with three (3) king beds and a futon.. Hardwood floors and cathedral ceilings decorate these luxury suites. So, it makes these one of two suites a must have for your luxurious relaxing vacation. 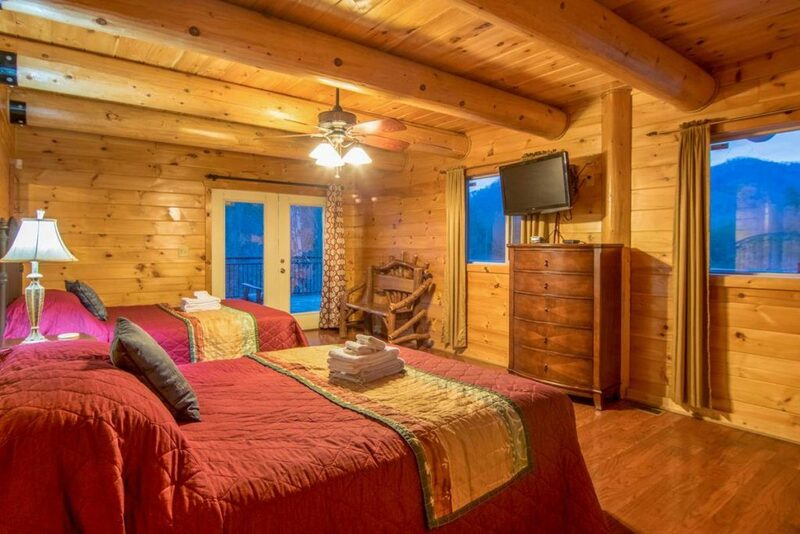 Both of these suites have three king beds and two televisions with hundreds of channels including HBO and Showtime. 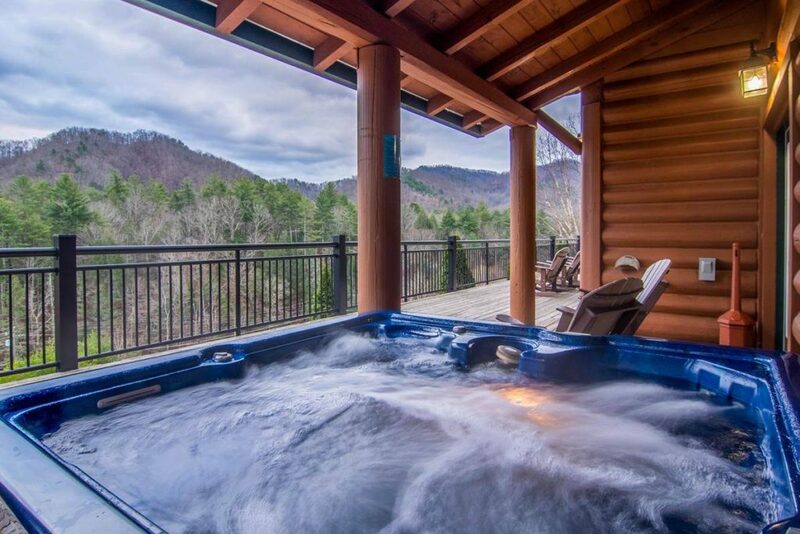 You will have access to your own private deck for some fresh mountain air, in addition to that you can set back and relax in your very own huge soaker tub with massaging jets. 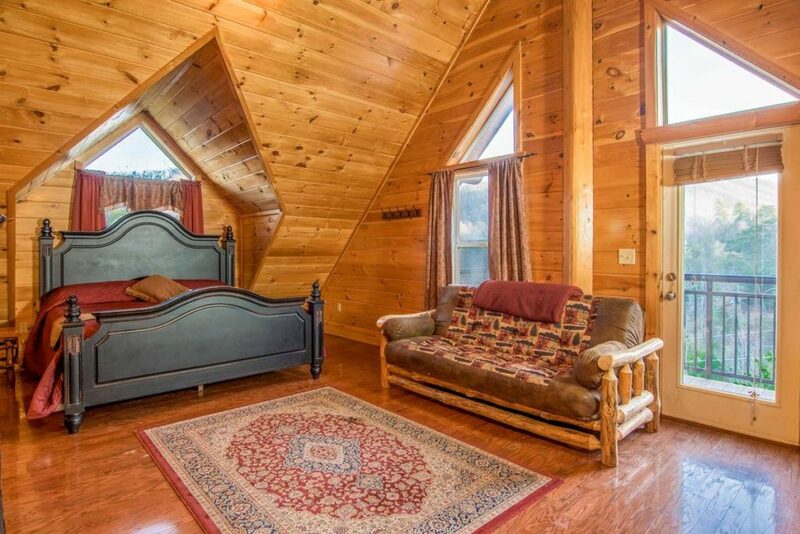 From this Smoky Mountain Lodge suite, you also have access to the loft where folks gather for quite talk time and board gaming. 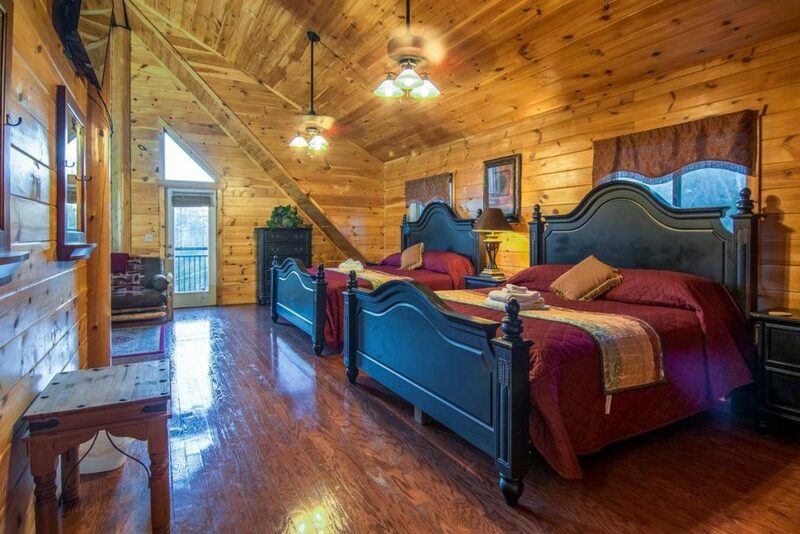 There are two large master suites located on level three each with three (3) king beds and a futon. 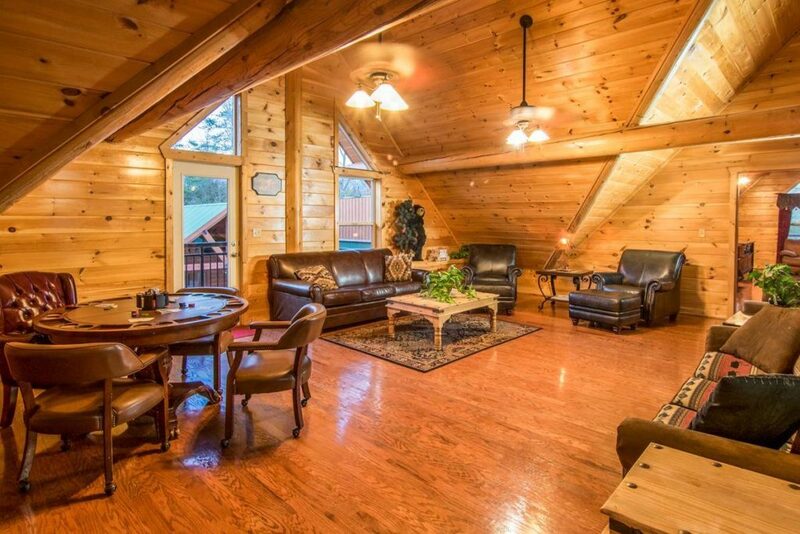 Hardwood floors and cathedral ceilings decorate these luxury suites. 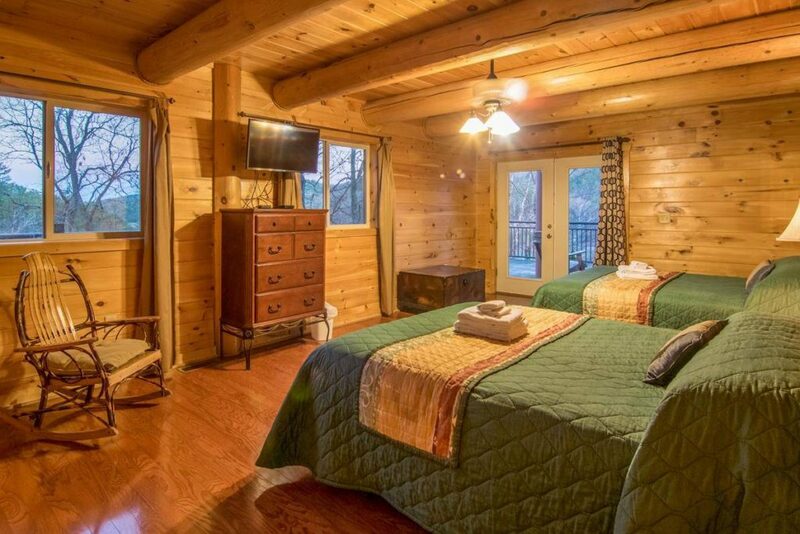 So, it makes these one of two suites a must have for your luxurious relaxing vacation. 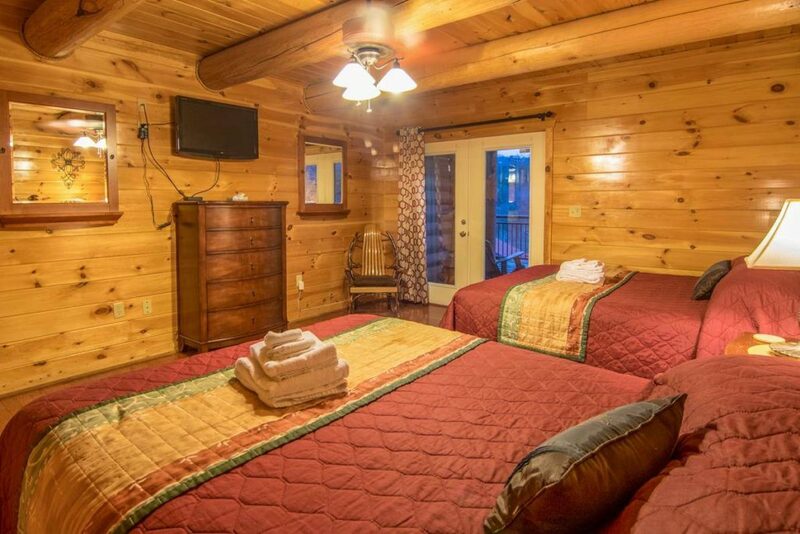 Both of these suites have three king beds and two televisions with hundreds of channels including HBO and Showtime. 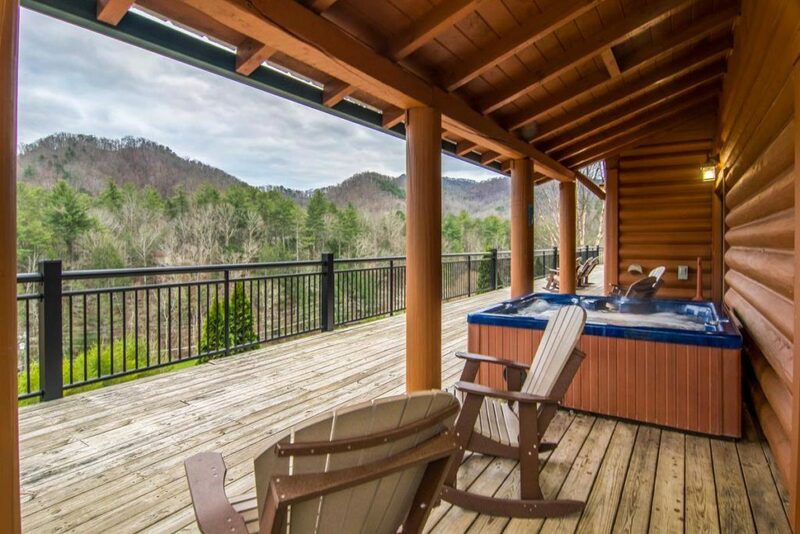 You will have access to your own private deck for some fresh mountain air, in addition to that you can set back and relax in your very own huge soaker tub with massaging jets. 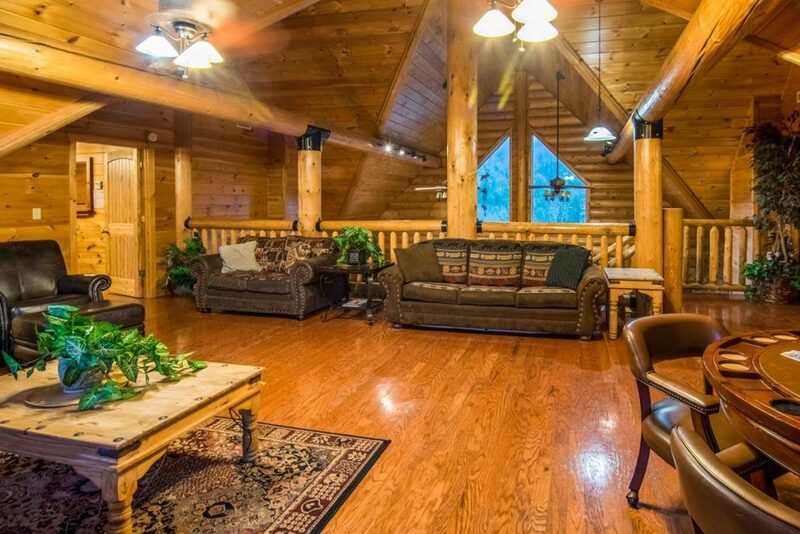 From this Smoky Mountain Lodge suite, you also have access to the loft where folks gather for quite talk time and board gaming. Take a dip in Pigeon Forge’s most luxurious indoor swimming pool. 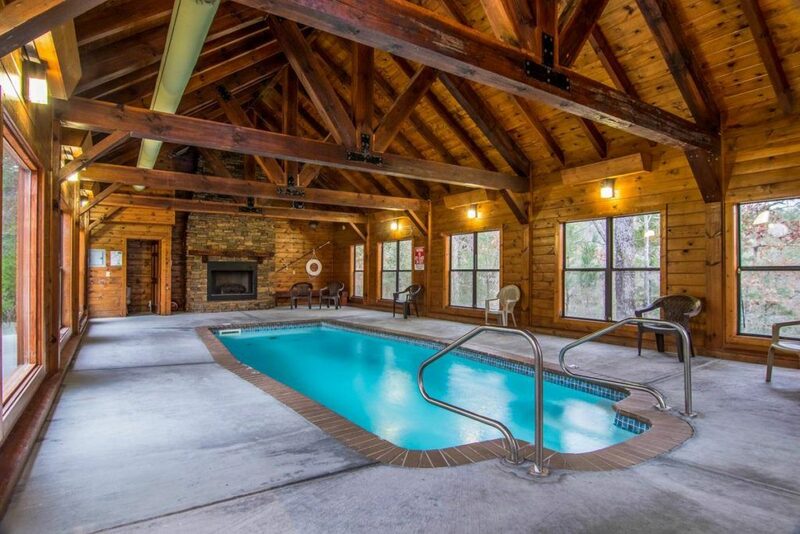 The indoor swimming pool sits just 150 feet from the lodge with beautiful 10×10 cathedral beam construction. 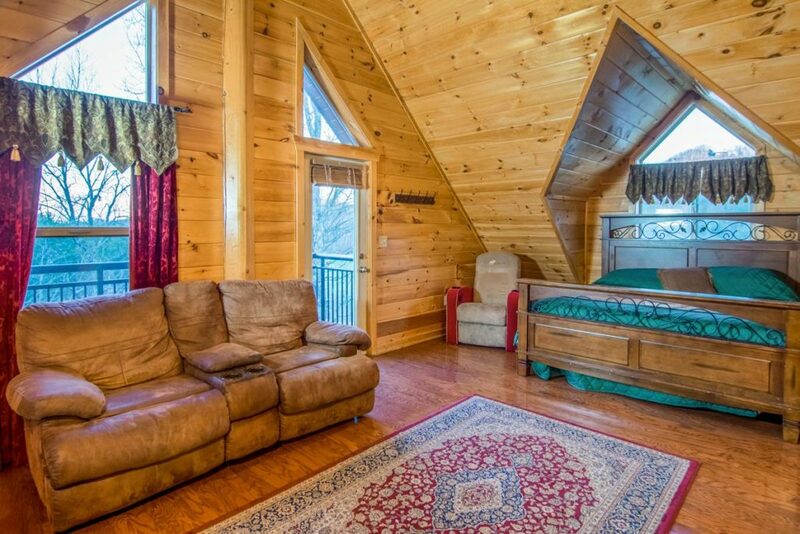 Above all, there are an abundance of windows, built to accommodate all of your relaxing needs and watch the kids. 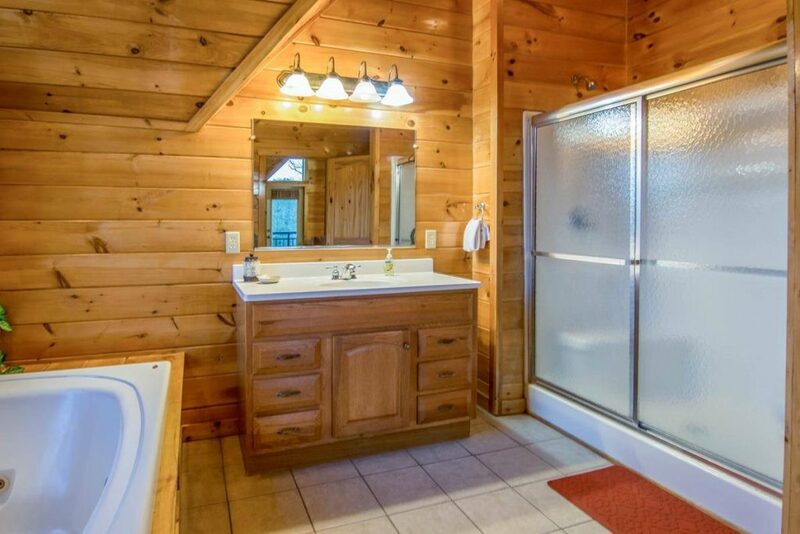 The pool size is 12’x30′ and 5.5 feet deep. 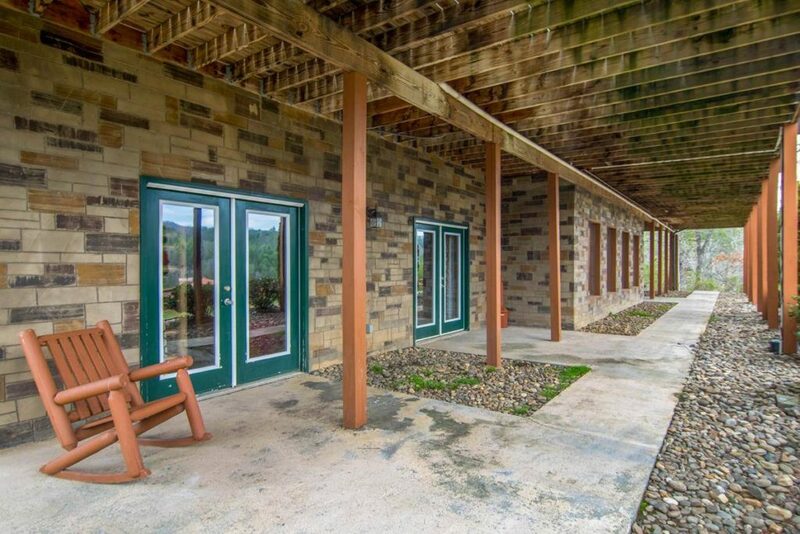 Additionally, the pool is climate controlled at industry standards for maximum comfort and reduced humidity. at a comfortable 81 degrees. 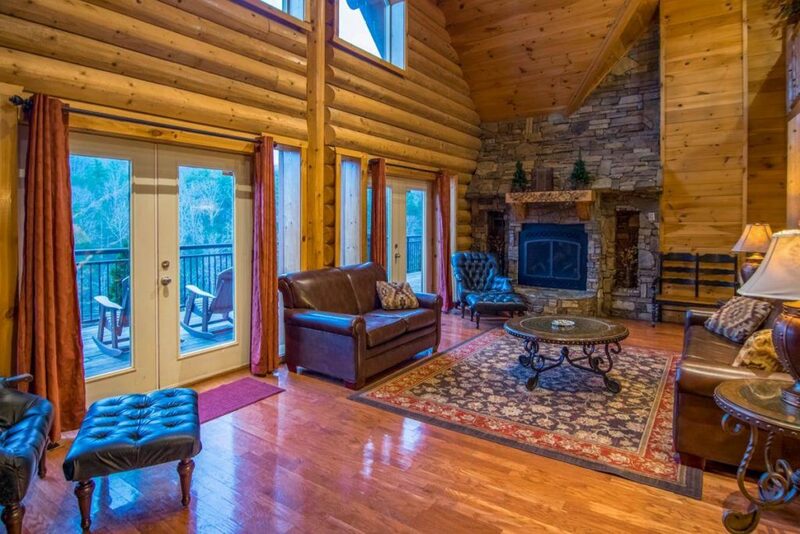 Certainly, we had to add more in the indoor swimming pool facility by adding an AMAZING fireplace. 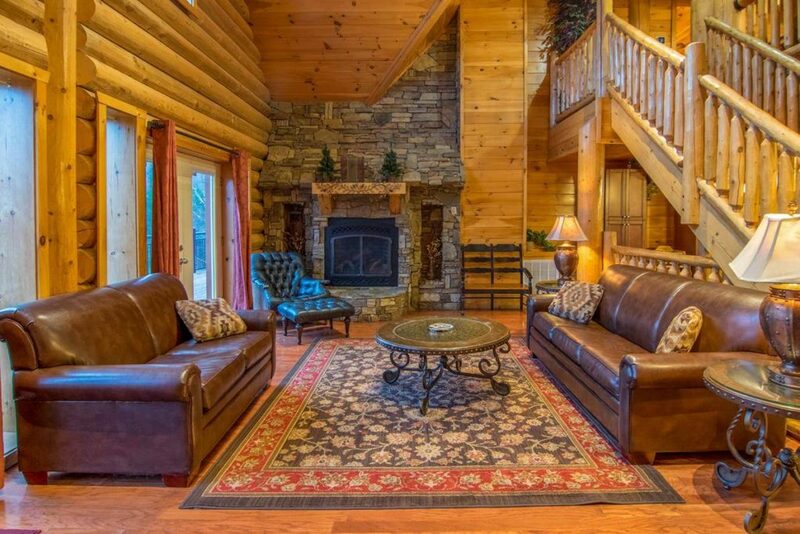 The fireplace reaches to the peak of the structure and boasts a beautiful 50″ hearth to provide maximum comfort and luxury! 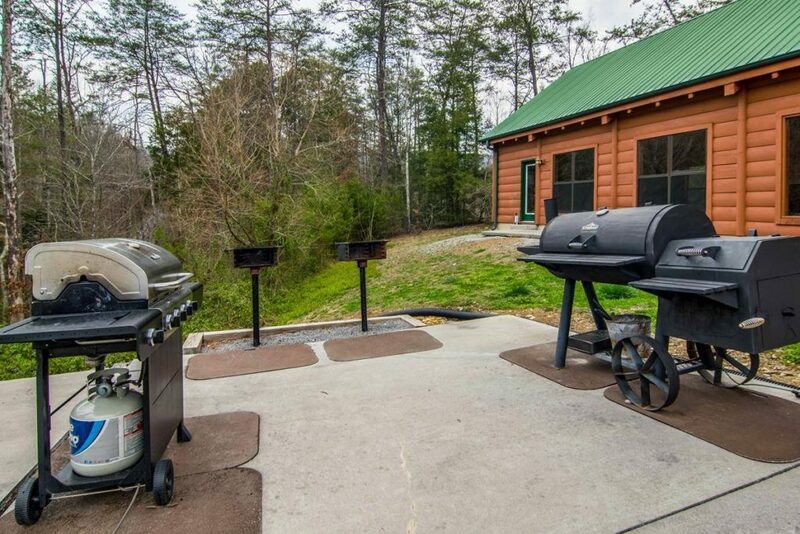 For those of you that enjoy barbecuing; there are two park style grills and one gas grill. 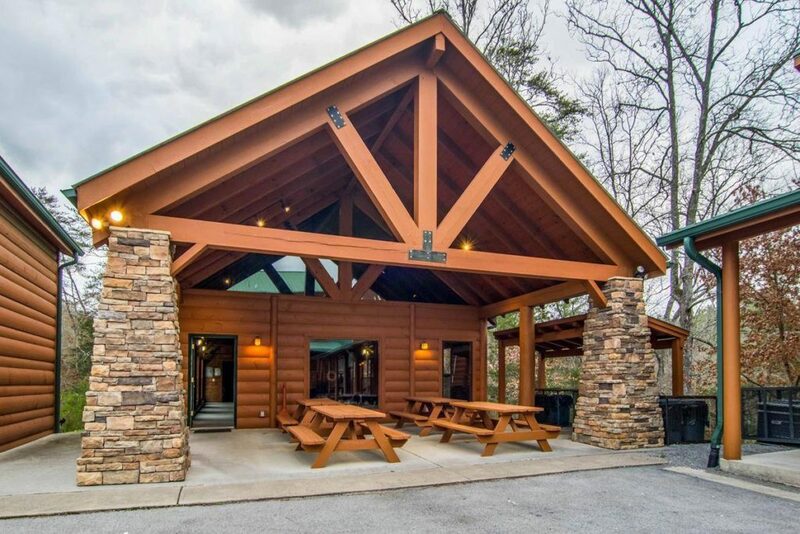 The covered area outside the pool house has a sitting area with four picnic tables. 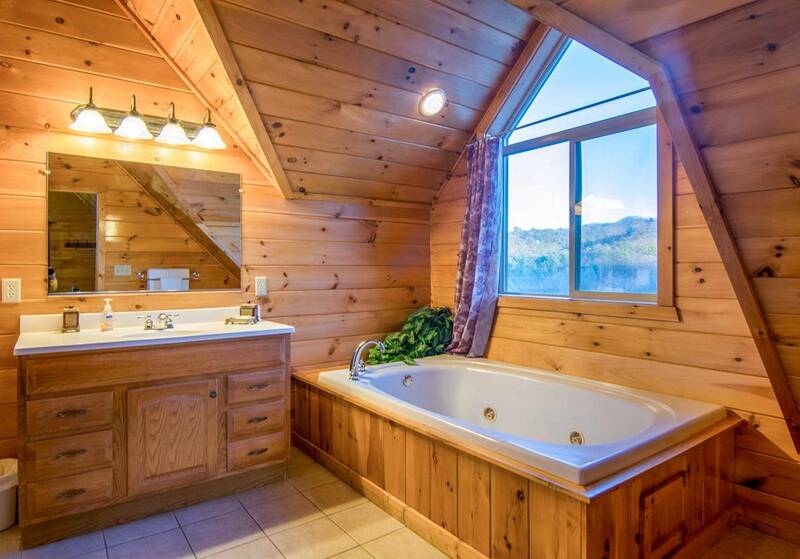 From here you can watch your friends and family enjoying their swim.